day of hearings on the matter on Monday. While the initial version of the bill, introduced in 2009, would have found homosexuality punishable by death, the bill's author, David Bahati, said the Parliament has "moved away" from such a provision, the Associated Press reports. Now, lawmakers are considering a recommendation by prominent Ugandan pastor Martin Ssempa to make homosexuality punishable by up to seven years in prison. Ssempa told the Legal and Parliamentary Affairs Committee Monday that he does not agree with the proposed death penalty portion of the law, but he said "homosexuality is killing our society." Another member of Ugandan clergy, retired Anglican Archbishop Christopher Senyonjo, countered the antigay claims, stating that witch hunts spurred by the bill could turn Uganda into a police state and increase the spread of HIV and AIDS because gay citizens would be too fearful of seeking treatment. He also said it was wrong for others to claim that school children were being recruited to become gay. Members of Uganda's parliament are working on a final revision of the legislation after years of backlash around the world has put the bill into a prominent light. In addition to the death penalty provision in the early version of the bill, it also mandated a death sentence for anyone living with HIV. The global LGBT rights group All Out is circulating a petition to Ugandan President Yoweri Museveni, asking him to veto the bill if it reaches his desk. 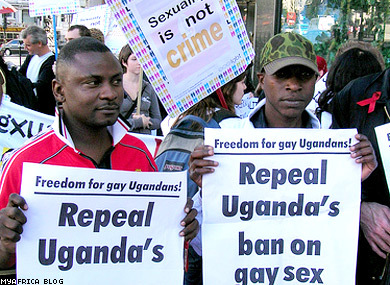 "The world is united with human rights activists in Uganda in asking that you publicly declare your intention to veto the Anti-Homosexuality bill," the petition reads. "Don't let this law, and the worsening human rights situation in the country, make Uganda into a pariah in the international community."